This week, NI-CO is hosting a high profile delegation from Ukraine who is visiting the province to explore examples of successful regional development initiatives in a post conflict environment. The programme was organised at the request of DG Regio in Brussels who are currently funding a large Economic Development programme in the country. During their weeklong visit to Northern Ireland, the group which includes MP, Mr Oleski Honcharenko, Deputy Head of Donetsk Oblast, Vladyslav Lavryk and Director of Economic Development, Lugansk State Administration, Andru Skubak, will visit Belfast, the city of Derry and Omagh. Focussed on the design, funding and management of projects from inception to completion, the tour showcased some of Northern Ireland’s most impressive regeneration projects to date including the Titanic quarter. 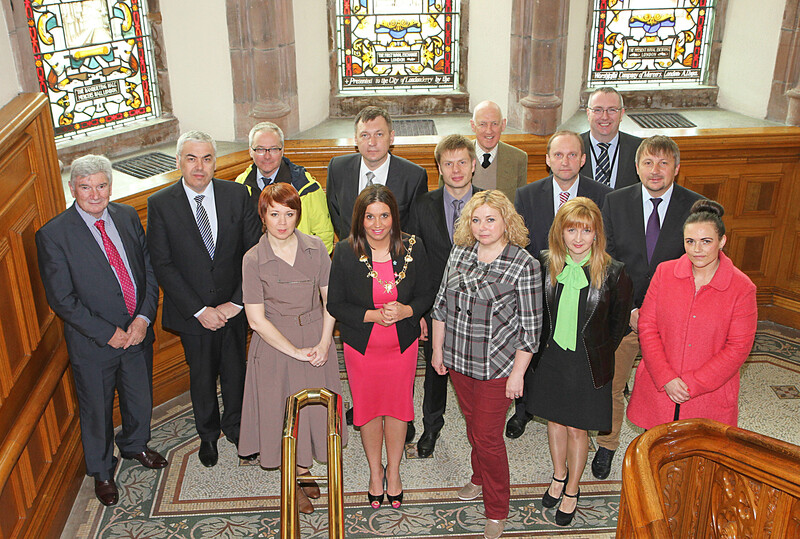 The Mayor Councillor Elisha McCallion, at the Guildhall to greet a group from the Ukraine, visiting Northern Ireland on a economic development study of the province. 2215-7590MT.